The precise services shown on each Mac can vary quite a bit depending on user built services or ones installed from apps, and though they’re often incredibly useful, some just aren’t necessary and you’d rather them be gone. Whether that’s because their usage is situational, your Services menu is just overloaded with way too many things, or if you just have something in there you don’t want showing up in that right-click contextual menu any longer, that’s what we’ll focus on here; removing items from that list. To be clear, this removes items, but does not delete the service itself, meaning you can easily go back and re-enable them again should you decide to reverse this and want a service or two back again. The changes are immediately visible in Finder, if you want to remove additional items from the menu just repeat the action and uncheck them for other services as necessary. When finished, quit out of System Preferences. Note the extended “Services” submenu has also been merged to become part of the general right-click menu because it dropped under 5 items. 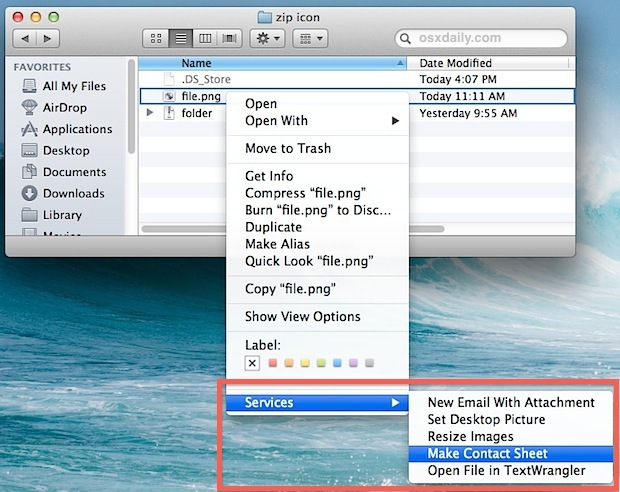 That’s because the “Services” section becomes it’s own dedicated submenu once more than four items or Service options are available for a given file, filetype, or folder, but with under five items, the Services menu blends into the general right-click menu of Mac OS X. If you’re concerned you accidentally enabled or disabled many Services items, you can always click the “Restore Defaults” button to go back what is shown by default in Mac OS X and the context menus, but if you’ve installed third party apps you will find you would need to individually reenable services for those apps again. Of course this goes both ways, and you can also sort around in the Services options of Keyboard Shortcuts to add more options to that contextual menus as well. A lot of optional features can be enabled this way, from tweaks to file system and management, to the excellent video conversion tools that are bundled in Mac OS X. 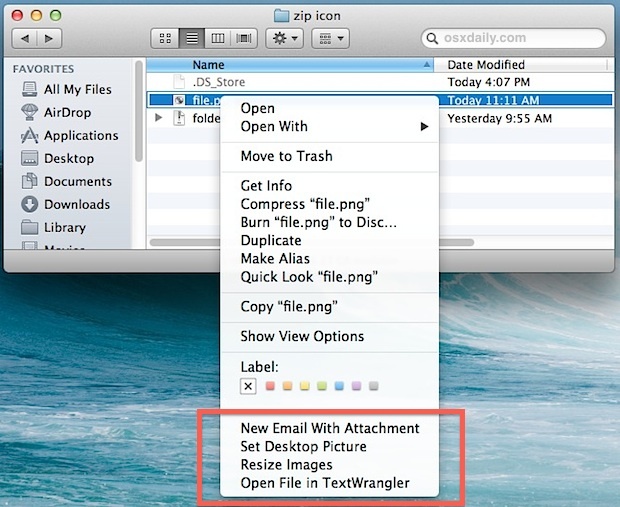 Speaking of the right-click contextual menu in Mac OS X, if you find a lot of duplicate app entries in the “Open With” section you can easily remove them with another trick, which will refresh the menu and force only single occurrences of apps from appearing there. Combine these two tweaks and you can greatly simplify and clean up the contextual menu system and the items that show up there. Some app/item isn’t in the Services list, but it shows up in the menu, where is it? This is particularly true with older versions of Mac OS X, and most modern versions will usually have this directory be empty. If you go there and don’t find the service or app you’re looking for, give the Services menu a second look. Thank you so much! I was having a heck of a time getting rid of the stupid “Send files with Team Viewer” item. cleaning keyboard & brought up this black sub menu, a rectangle with white copy that is telling me every single thing I’m in or selecting. What is this and please how do I get rid of it? How do you change these contextual menus on an application basis ? 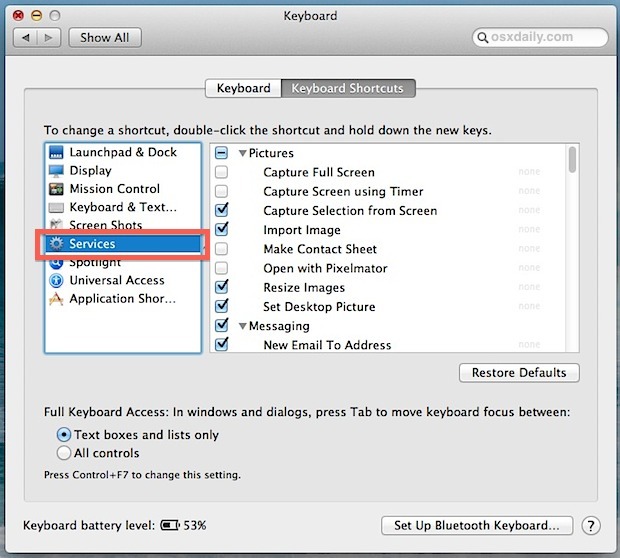 Removing “Open URL” or “Search with” from the Keyboard/Services preference does nothing in TextEdit. It still persists in the menu afterwards.